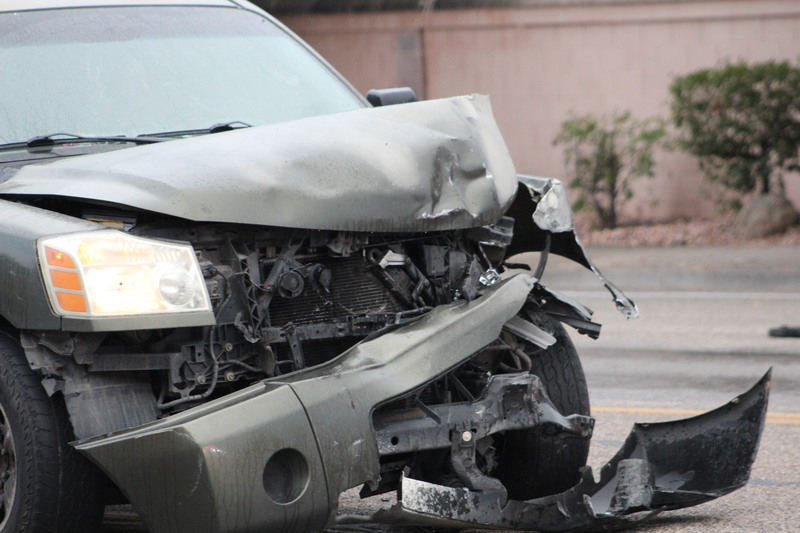 ST. GEORGE — Two women sustained minor injuries and both vehicles were a total loss following a T-bone collision early Thursday morning. 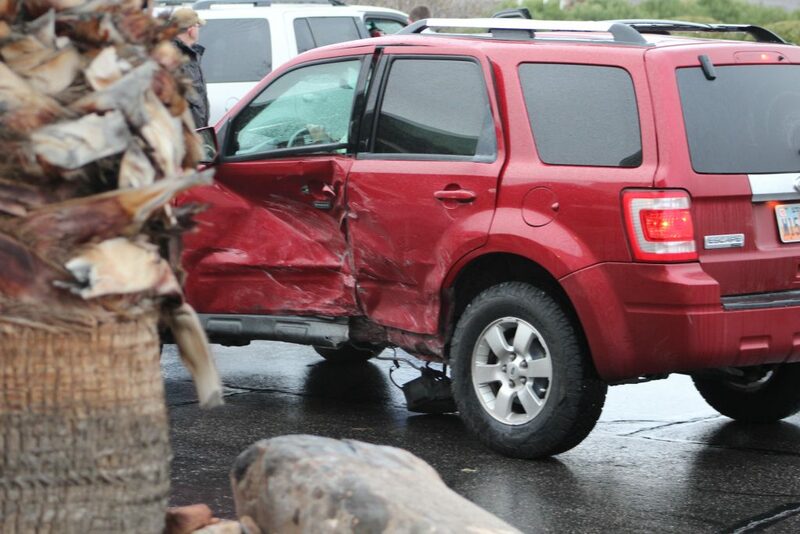 At approximately 7:30 a.m. the female driver of a red Ford Escape was waiting to make a left turn onto Dixie Drive from the parking lot of the Oasis Palms apartments at 260 North, St. George Police officer Burkeley Christian said. 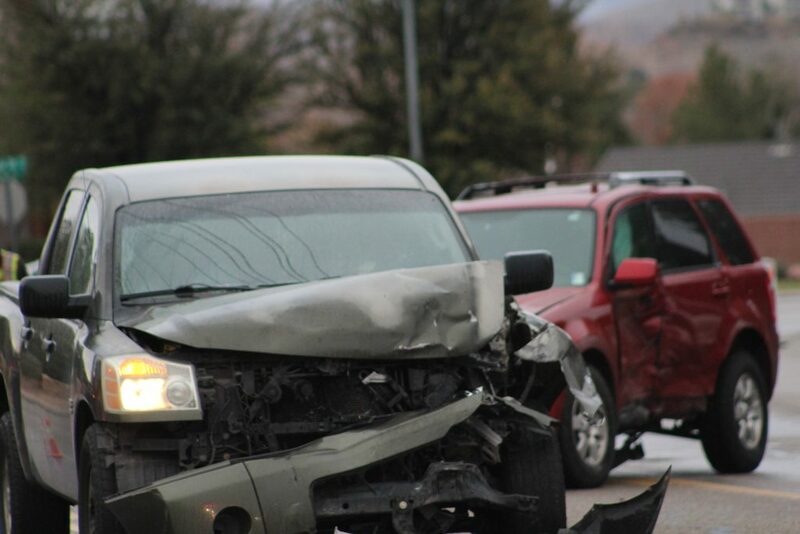 Thinking the way was clear, she pulled out into the roadway. 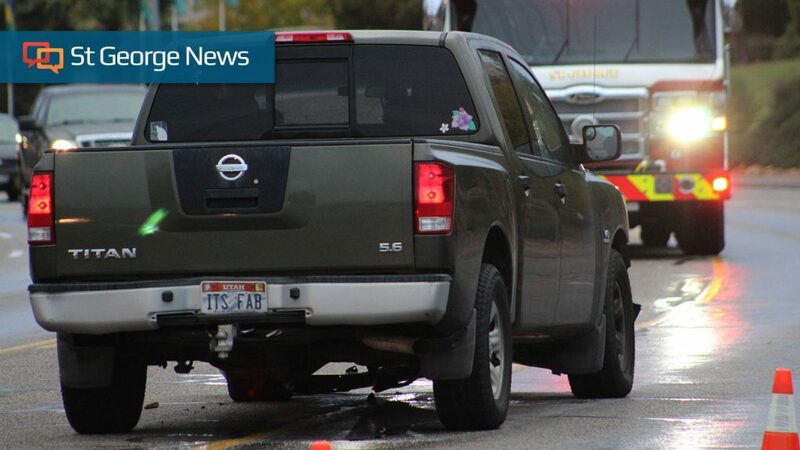 At the same time a woman driving a gray Nissan Titan was traveling northbound in the inside lane didn’t see the impending danger and slammed into the Ford. 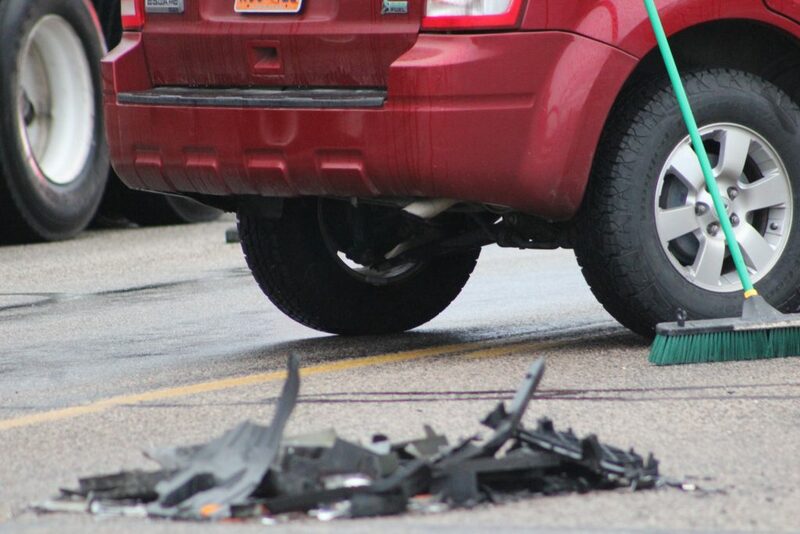 She told St. George News she wasn’t wearing her seat belt at the time because of a surgery the previous week. The Escape was spun around and ended up partially blocking the southbound lane. Besides the injuries to the driver of the Nissan, Christian said the driver of the Ford, who also had three kids in the vehicle, was complaining of chest pains and transported herself to the hospital to be checked out. 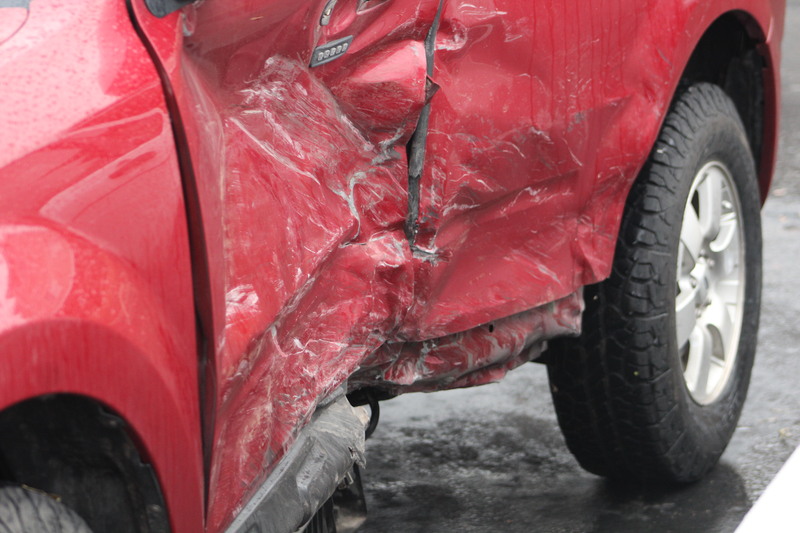 During the course of his investigation, Christian discovered that the driver of the Ford failed to yield while exiting private property onto the roadway and was subsequently issued a citation. 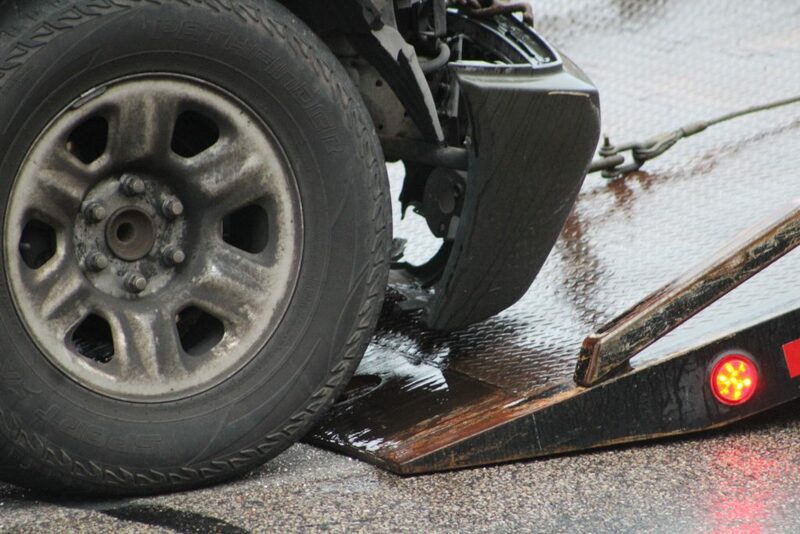 Christian also cited the driver of the Nissan for failure to have valid insurance, and he performed a complete inventory of her vehicle before allowing it to be towed from the scene and sent to the state impound yard. Although heavily damaged, the Ford was able to be driven off the road, Christian said, and towing would be handled by the owner. 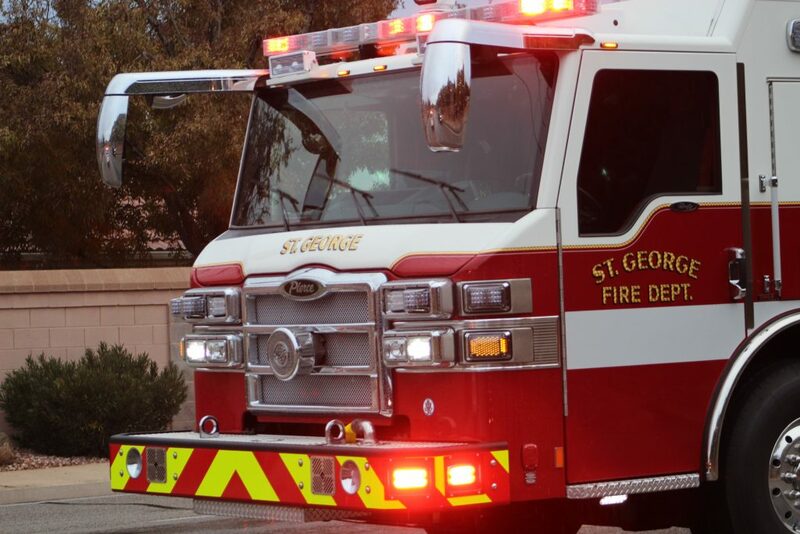 Members of the St. George Fire Department were also at the scene assisting Christian, and traffic in the area was slowed for about an hour while they helped clear up debris from both vehicles. I drive on Dixie road a lot. It is not uncommon to see people shooting out onto the highway from the apartment complexes and side venues, including the Ward parking lot as well. A banzai move of this nature assumes the other driver will slow down in time. That is a stupid risk in this town. Over time I have adapted to driving in the center lane furthest from the side of the road. It is simply safer, although the trade off – a faster moving lane. Defensive driving 101. Dixie Dr has become a highway with high volumes of traffic, which will only increase with Santa Clara / Ivins build outs. The Bluff work pushed a ton of traffic onto it as well as getting it’s own on/off ramp on I-15… I have seen many dare devil darts into traffic from the side streets on Dixie. At this point Bluff is still under utilized since completion. Making a left hand turn to go SB on Bluff from the East side streets is a real life risk, cutting across three lanes. Give it a few months, that maneuver will be near impossible. What happened to our sleepy town? Oh lets build a pipeline now! “Thinking” the way was clear?, She pulled out into the roadway? Try “looking” and “making sure” the way was clear next time. Just a suggestion. “Thinking” is o.k.. in some circumstances , but this time. “Knowing” may have been better. Especially for the vehicles she totaled and the fact she could have killed someone.